Tottenham Hotspur and Schalke 04 belied their reputations to knock seven-times winners AC Milan and twice finalists Valencia out of the Champions League on Wednesday with performances that went entirely against type. Surprisingly, it fell to Schalke to supply the outstanding forward display as they shrugged off poor Bundesliga form and intense pressure on coach Felix Magath to beat Valencia side 3-1 and win 4-2 on aggregate. Wednesday's games were inevitably something of a comedown after Barcelona's heady win over Arsenal on Tuesday. While Tottenham were never likely to match the Catalans for panache it was still a surprise to see them take such a pragmatic approach against Milan. Tottenham racked up 18 goals in the group stage, playing with a bravado that seemed to wilfully invite trouble, but back at White Hart Lane in the knock-out phase they packed the defence and let Milan come at them. The surprise tactic made for a tense evening for their fans but, in truth, Milan created only a few clear chances, with Robinho missing the two best -- a weak effort that William Gallas cleared off the line and a shot that fizzed just over right at the end. Milan, who have not reached the quarter-finals since they last won the competition in 2007, had plenty of possession but their attack was more blunt instrument than the fine blade required. 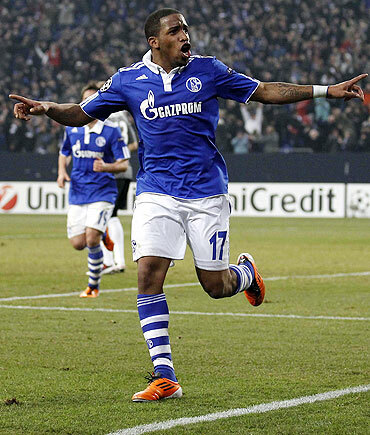 Schalke had no such problems thanks to the razor-sharp Farfan but they also had much-admired goalkeeper Manuel Neuer to thank for victory on a night when they really chanced their arm. Valencia took the lead with a Richard Costa header in the 17th minute before Farfan curled in a free kick for the equaliser to launch the comeback. 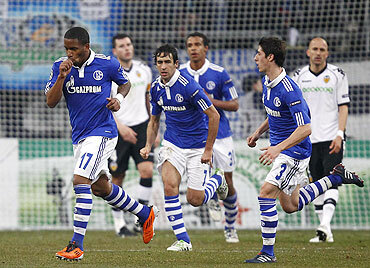 "I hope I gave our fans something to smile about," Farfan said. Schalke, down in 10th in the Bundesliga, are through to the quarter-finals for the second time since 2008, while Tottenham have to look back to 1962 for the last time they reached such European Cup heights. They joined Barcelona and Shakhtar Donetsk, who pulverised AS Roma on Tuesday, in the draw for the last eight, with the remaining four places to be decided next week. Spurs advanced to the quarter-finals after another night of unrelenting tension at White Hart Lane and the London club's unlikely adventure among Europe's elite continued. Milan's big-name players like Zlatan Ibrahimovic, Robinho, Alexandre Pato and the evergreen Clarence Seedorf fought non-stop but despite creating the better chances they failed to make the last eight for the fourth successive season. Spurs, who won 1-0 at the San Siro with a late Peter Crouch goal, could not press home their advantage but the Premier League side gave a resolute defensive performance to reach the quarter-finals of Europe's premier competition for the first time since getting to the European Cup semis in 1962. "It's a fantastic achievement for this club, playing in the Champions League for the first time in our history. To have beaten Inter Milan in the group stage and now AC Milan, well anything else is a bonus now, just being in the Champions League is a bonus," Spurs manager Harry Redknapp told reporters. "Two years ago no-one would have believed we could do this, that's the improvement we have made." Milan coach Massimiliano Allegri said he was "very very disappointed" his side lost. "I thought we played very well, we made all the chances, the players worked very hard and the only mistake we made is that we did not score a goal and that's what we have been punished for," he said. "So from tomorrow morning we will focus on winning the Serie A title. I think we deserved more, because apart from the first half of the first leg we were the better team." He also defended the performance of Ibrahimovic after being criticised by Italian journalists as being the worst player in the Milan side. "He is a great player, he played very well tonight, brought his team mates into the play and worked very hard. But if I have any regrets, it's that we deserved more out of the tie. I feel bitter about that."